I read recently about the American College of the Building Arts in Charleston, South Carolina. The college is a four-year program that provides a liberal arts education as they train artisans in the classic techniques of building and artistry. The school uses the wisdom of builders and architects passed throughout the generations in order to produce the exceptional builders of today and tomorrow. The school produces graduates that can restore older buildings as well as build new structures and art that will last for generations. The college creates a space where the past and the present work together in order to create beauty for the future, a future built on the wisdom of the past. The American College of the Building Arts reminds me of the vision for the Highland Church. As we look to the future of Highland we also must become skilled artisans in ancient Christian practices passed on through the years. We must be truly gifted in showing hospitality to strangers and to each other, in prayer that shapes us into the image of Jesus, in allowing the world of Scripture to fill our lives and imaginations, in loving God, in loving our neighbors, in generosity, and in knowing and living the story of Jesus. The Highland Church of Christ is over 75 years old, and we continue to exist as a vital community of faith because of the faithful and courageous people that served, worshipped, grieved, risked, loved, and passed on the faith to the next generation. We know that we are blessed to have such a rich heritage, and yet we also acknowledge that the majority of churches Highland’s age are decreasing in size and vitality. The Highland Church must continue to consciously and courageously partner with God to risk, to welcome our neighbors, to invest in healthy community, and to make sure life inside the walls of Highland form people and families into the image of Jesus. We want Highland to be a place where the past and the present work together in spirit-filled ways to create a beautiful future. So what does A Restoration Movement mean for the Highland Church? We want to grow to be a church of 3,000 members meeting at the three campuses of the Highland building, Freedom Fellowship, and Grace Fellowship. The city of Abilene has around 75,000 people that are not connected to a church in anyway. The Highland church is a great community that we believe can help change lives in positive ways as we continue our mission of drawing all people to God. We believe intentionality about growth is important. We do not become a church of 3,000 by simply wishing it to happen. We want to continue to make our assembly times dynamic and meaningful. We need to continue to cultivate the ancient art of hospitality or welcoming the stranger. We want to purposively improve upon our welcoming systems so that every person that enters into our doors is greeted and placed upon an intentional road of joining the Highland family. We will need more greeters every week and all members always looking for visitors and ways to welcome them. Smaller pockets of community are essential for large churches. As part of Restoring Highland we want to continue to improve on connecting all people to a bible class or a small group so that they cultivate vital relationships. The fellowship found in these pockets of community help to ensure that the people of Highland have partners as they walk the journey of life in Christ. Systemic efforts are needed to help continue to improve the way we connect people to community, and we will also need the efforts of each person consciously working to plug people into small groups, ministries, and bible classes. We believe that all of us who share life in Christ at Highland are people in need of restoration. We have families of all different shapes and sizes at Highland, and we want to continue to make Highland a place where we equip families to grow and mature in Christ. Our prayer is that our families play an important role in writing the story of Jesus on the hearts of everyone in their family, and we want Highland to be a place where families grow in faith together. 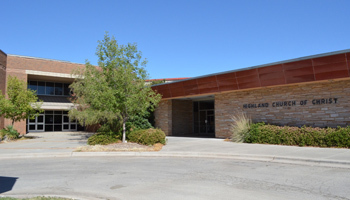 For many years Highland has worked in the communities around the buildings of Freedom Fellowship and Grace Fellowship. We want to build upon those years of faithful ministry and continue to expand the work at those campuses. We want the neighborhoods surrounding the buildings to see the spaces as places of worship, community, and a home for resources they truly need. For Restoration of Highland to occur we must all be master craftspeople of the ancient Christian practices, so join us in using ancient arts in relevant and authentic ways to move forward into a wonderful and faithful future.